Andrew Pennington never expected to become the Marquis of Whitbury. But when his uncle and cousin each die quite suddenly, he inherits the title. Now, to his chagrin, he is the most sought-after bachelor in London--chased by all sorts of women. Justine Rawlings comes from a noble, esteemed family. Her younger sister, Charlotte, wants to waste no time and marry her childhood sweetheart, Kevin. But Justine's father insists Justine must follow custom and get married first. In order to prevent her sister from eloping, Justine decides to find a fake fiancé--fast! What could be better for these two old family friends than to pretend an engagement in order to solve their mutual dilemmas? But their problems are far from over! Someone is threatening Justine with harm. Charlotte is convinced that Justine truly intends to marry Andrew. And Justine finds herself falling in love with her pretend husband-to-be. As attempts on Justine's life escalate, Andrew becomes increasingly alarmed. His concern stems from the fact that she's an old family friend... doesn't it? ​Andrew and Justine must quickly face their true feelings for each other--before it's too late! "A fun, frothy, delightful story about a brand new marquis and the snappy heroine who isn't chasing him--unlike the rest of London!" 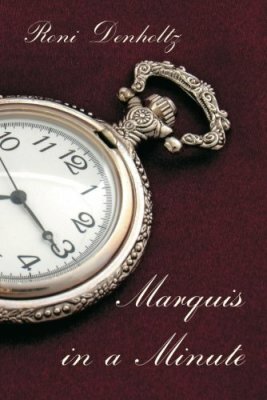 "Marquis in a Minute is a delightful blend of love and intrigue with endearing characters that tug at your heartstrings. Enjoy the feeling of falling in love all over again--read Roni Denholtz's Marquis in a Minute!"